Staggering around in the dark! I sometimes forget just how little I can see ….until that is my PC crashes and I have to try and use this laptop. It’s not that it’s actually any more difficult to use, it’s just that its different. The answer to being visually impaired I think, is routine. When suddenly what you’re used to is unavailable, things get a whole lot more challenging ….and more importantly, when you’re running a business, time consuming. You know what they say about time being money ? As my sight has got worse over the years, small problems with the computer become large ones and I seem to spend more of my time working on the computer than I do on the paintings……or it certainly seems like that! As an example of this ….I’ve now spent almost an hour and a half just getting this laptop booted up and getting to this point. Ahhhhh! Anyway, I’ll stop my moaning and get on with the blog ….which is far from staggering around in the dark ….it’s about the opposite in fact …..it’s about wandering over the fine little tops of the Pentland Hills the other day. Our last walk, in the snow around Loch Ossian the other week, was great but we really needed to get a few metres of ascent and descent into our legs this time. As usual we were looking to follow the best weather and after changing our plans at the last minute, we decided to head over to the east and enjoy our annual visit to the Pentlands. These hills are not huge in any way but there is a bit of ascent and descent between each one so at the end of the day you feel like you’ve had a good walk. The forecast seemed to get it right as after a very wet drive over from Irvine, as we neared the hills, the cloud broke and the sun started to come out. By the time we’d got the boots on it was looking really good. At the point where the path starts heading up towards Turnhouse Hill, it takes a small footbridge over a stream and as we crossed, Nita spotted a Dipper sitting on a rock not far away. It was great as with a few directions I managed to find it with my monocular. From this point, the path climbs at first gently and then more steeply to reach the top of Turnhouse Hill. It’s a fabulous view point and I guess, needs to be as by this time the legs are complaining somewhat! The big views however, continued for the rest of the day as we wandered along the ridge. Nita could see the two bridges over the Firth of Forth, as well as Edinburgh airport with the planes coming and going. It’s quite strange to be up in the hills and yet so close to a city. Our original plans had simply been to walk along the ridge to West Kip before descending into the glen and walking back along the single track road past the two reservoirs. 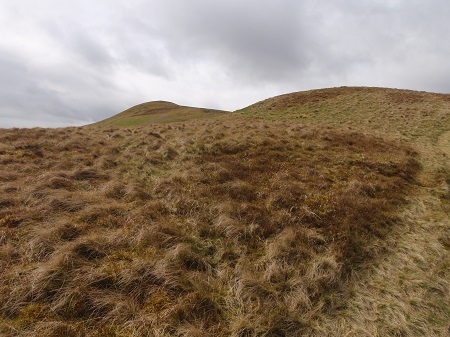 However, as we approached the summit of Scald Law, (the highest point in this group of hills) I remembered South Black Hill ….a top that rises to the south west of Scald Law and somewhere we’d never been to before. It seemed well worth a detour and being to the south of the main line of hills, gave some wonderfully different views. It was about at this point that Nita suggested that instead of walking back along the road in the glen, we go back the way we’d come ….thus giving us a few more metres of ascent and descent. It seemed like a good idea and made a great little day. As we got back to the wee footbridge we were given a quick fly-by from the Dipper and on walking the final few hundred metres through the woods to the car park …we were treated to the sound of a woodpecker on one of the trees….what a great way to finish a day. When I feel like I’m staggering around in the dark using the computer, I just have to remind myself of all the hills I walk and the paintings I paint! >> Next Post: Stretching the legs…..